Let's head over across the sea to the Netherlands. How we get Dutch out of that is well, well beyond me. I'm sure there is a significant list of reasons as to why we use this particular nomenclature in English, but I don't feel like doing that research at this particular moment in time. And that of van Persie. You may recall that I'm an Arsenal fan and yes, I'm still bitter about that transfer.... Anyway, today I'm examining another debut album. Out of the ashes of several Dutch bands, the guys, and girl, have formed Bleeding Gods. Though our new friends are from Northern Europe, today's offering isn't Black Metal, far from it. It's also not European Death Metal or Gothenburg Metal. It is definitely death metal, but it's not what I deem to be traditional death metal. 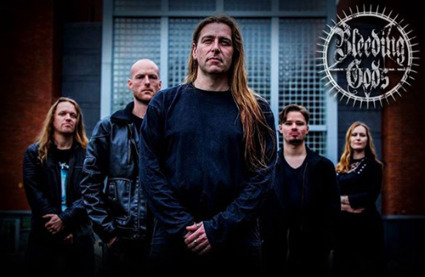 Death metal is moving away from its paint by numbers approach and newer bands are heading towards the approach of bands like Obituary and Carcass. Instead of fitting their sound into the rigid confines of what death metal is (was? 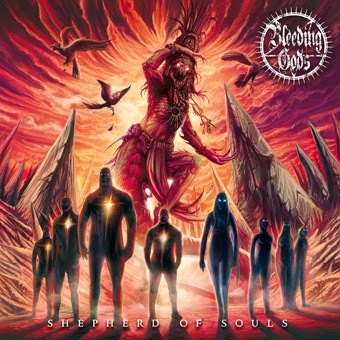 ), Bleeding Gods chose to fit death metal into their songs. In a refreshing change of pace, they have written songs and taken them to the level of extreme metal, but they're still hard edged rock'n'roll songs. The deftness of the music will leave very few unimpressed. The vocals, though heavy and scary, do not enter into the "are you serious" territory of certain genres of metal and some death metal acts. This is a spectacular debut and they'd better keep'em coming and make a tour stop in St. Louis.